Trained as an electrical engineer and a researcher (PhD), I have always worked in R&D, in various positions, for multiple product ranges. Within Schneider Electric, an industrial company, I have been involved in engineering, marketing and project management. With my successive teammates, I discovered and practiced agility to develop and launch on the market innovative products or software. Leading a group of men & women to satisfy their customers and, at the same time, to increase the profitability of the company is a stimulating and addictive challenge. The smiles of the team during the development and just after the launch are a powerful motivation. Step by step, innovation and agility became not only my job but also a passion and a topic for training and thinking. For more than 15 years, I am teaching innovation and agile project management at Grenoble University and also now in Tunisia. The final sequence of the course is a project serious game where the students, organized in teams, develop and launch an innovative product in a few hours. This course is now in English! To download it, please click here. 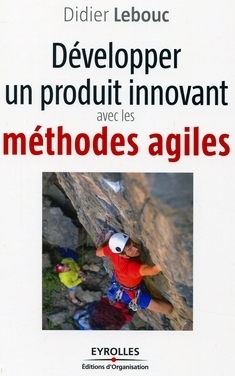 I also wrote a book published in 2011 by Éditions Eyrolles “How to develop an innovative product with agile methods?”. Frequently, I publish on my blog chronicles about agility, innovation and the societal changes they induced. I am now also posting short videos on YouTube about these topics (in French). Now, I have co-founded in Grenoble, with Anne Munchenbach, the consulting firm innotelos | vitamins for innovation to support innovating companies & organizations in 2 domains : agility & project management and marketing & strategy. If you are interested by innovation, agility & strategy, feel free to contact innotelos.